Adventures of the Polka-Dotted Teacher: 12 on the 12th! 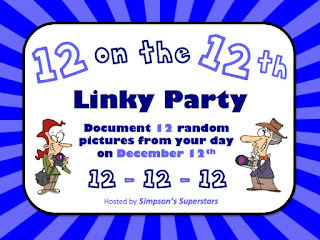 You know I love a good linky party! I tried to be better at taking pictures today, so when I remembered I grabbed my phone and grabbed some shots of my day! 1. We started a new unit today in math! It's all about perimeter and area. So today we looked for measurement benchmarks. My friend here is measuring our Christmas Tree! 2. Two of my girls measuring our chart paper. 3. After math, we have snack and track. I snapped a picture while I was walking on the track. 4. I forgot to take pictures during Reading & Writing Workshop. But I grabbed a pic of two of my kiddos meeting with their writing buddies! 5. After lunch, we had our Holidays Around the World Time. You know integrating Social Studies with Shared Reading and still doing Christmas things. Whhhhaaaattt! (can you tell I'm proud?) We have been using Rachel's Holidays Around the World pack. The kids have loved it! Today we learned about Las Posadas, so we created poinsettia ornament picks. I decided to wear mine in my hair. Lots of my little ladies followed suit. My boys loved the fact that they were poisonous plants. Although one boy, decided to dance the tango with the ornament in his mouth like a rose. I wish I would have got a picture of that! Here are the directions for the ornament from First Palette. 6. Yesterday we learned about Hanukkuh, so the kids wanted to play our Hanukkuh Memory Game from Denise's pack again today. So I obliged after Media & Music. 7. We finished our letters to Santa and created our Techy Santas! These are from the Fab Reagan! 8. 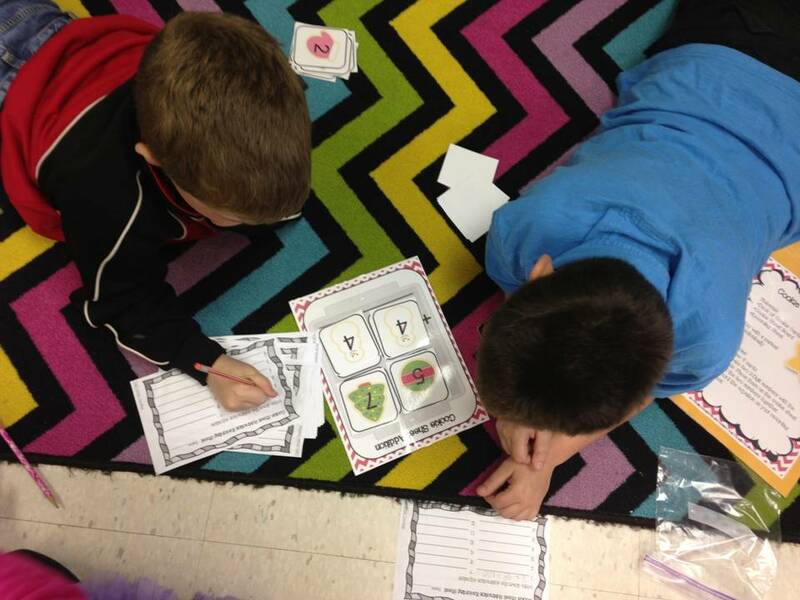 At the end of the day we had a few extra minutes so they went to their next rotation in our Holly Jolly Math Centers! 9. I love this Mailbox! I haven't shared it with you guys yet, and it just makes my little heart happy. I bought it from Kirkland's the day after Thanksgiving. 10. I had to leave right after school to ride with my mom and brother to Columbia, SC. Adam left today on a mission trip for Hurricane Sandy Relief. His school's BSU teamed up with some other colleges in SC and are spending the next week on Staten Island! 11. I really had to use the bathroom. Like bad. So we stopped and this was what I found. Apparently the bathroom was broken. 12. After we dropped Adam off, we went to Copper River Grill. I love that place and we don't have one in the Charlotte Area! So those are my 12 pictures from today! We didn't do much at school for 12-12-12, because well as you can tell we have been busy (and I kept forgetting to take pictures of everything else!). But, while we were talking about it, I told my students that they would be 108 when 12-12-12 happened again. Then I said, "Well I'll be ..." and I was interrupted by one of my not-so-sweeties yelling out, "150!" Not cool! Be sure to check out Stacy's fun linky! 1. LOVE the mailbox. 2. You know SOMEONE will still try to use that bathroom!! I LOVE that Christmas Around the World unit. I used it last year and loved it. Holiday cheer + social studies? It's a win/win. That mailbox is too cute! I'm a new blogger and would love for you to stop by my blog. I'm having a little giveaway! I love that mailbox!! If I had that in class I would have tons of letters everyday!! Oops! Hi, Amber! I love seeing pictures of your class! It looks like they are loving your lessons. I teach 3rd down in GA and I' ve found several of your ideas that I want to try! I love your mailbox too! I wish I'd seen this linky party in time. Looks like it was super fun to participate in! The BEST and BRIGHTEST of 2012!